In this second instalment of the creation of the Sainsbury Institute for the Study of Japanese Art and Cultures, Professor Nicole Rousmaniere, the Founding Director and currently Research Director, continues her interview with Dame Elizabeth Esteve-Coll. Dame Elizabeth is the former Vice-Chancellor of the University of East Anglia and Director of the Victoria and Albert Museum, and since its establishment in January 1999, a Trustee of the Institute. During this second interview, Dame Elizabeth reviewed the history of the Institute, particularly in regard to location and staffing and commented on recent developments. Dame Elizabeth’s unswerving support for the Institute and her clear sense of direction for the Institute are a source of inspiration and invaluable help. 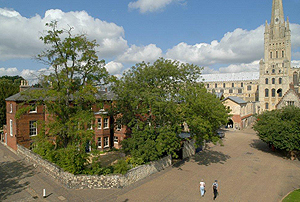 With her guidance this small acorn of an institute has grown into an international centre for Japanese art and cultures, replete with academic events, publications and lectures as well as being a gathering place for scholars and the Norwich public, and housing an important specialist library. In 1999 Dr. Nicole Coolidge Rousmaniere, who had been a lecturer in Japanese Art History in the School of World Art Studies and Museology at UEA, was appointed Director of the Sainsbury Institute for the Study of Japanese Art and Cultures. With Dame Elizabeth’s careful guidance, the first task after creating the mission statement for the Institute was to locate a space for the nascent organisation and to create a staffing structure. Dame Elizabeth supported the Director on both fronts and she explains below how this was satisfactorily achieved. With the help of Sir Tim Lankester, then Director of SOAS and with thanks for the wonderful generosity of Mr. Handa Haruhisa, Professor Timon Screech and Dr. John Carpenter joined the Institute as Japanese art history research associates. In addition, the Institute established a position for Dr. Simon Kaner, who specialises in Japanese archaeology. Hearing that 64 The Close was to become available, Dame Elizabeth and the then Dean of Norwich Cathedral, the Very Revd Stephen Platten, investigated its possibilities under the cover of darkness. However, it took 18 months to restore the beautiful edifice with its red and yellow Victorian tiled floor and grand staircase (The building’s archaeological history is covered in a separate article in this issue). The year 2013 marks the 10th anniversary of the Lisa Sainsbury Library. The Library was officially opened on May 2003, inaugurated by the then Ambassador of Japan, Orita Masaki, and his wife Madame Orita. Our Lisa Sainsbury Librarian, Hirano Akira, moved from London in time for its opening. He had previously worked at the Library of SOAS, helping to catalogue the new Lisa Sainsbury Library collections. From the outset the Lisa Sainsbury Library was supported by generous donations. 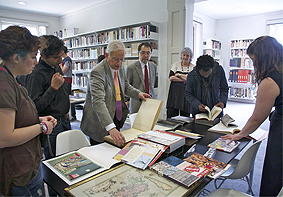 In autumn 2001 more than 15,000 volumes on Japanese art, which had belonged to the well-known Japanese art historian Professor Matsushita Takaaki and Professor Matsushima Ken, were given to the Library – a donation arranged by Professor Matsushita’s son-in-law Professor Kawai. With this superb collection of books on Japanese medieval art as its core, the Lisa Sainsbury Library has become one of the foremost resources for Japanese art studies in Europe. The Bernard Leach collection was acquired thanks to Lady Sainsbury’s generosity and amounts to about 200 books on East Asian ceramics. Once owned by the celebrated potter Bernard Leach, the books were in his widow Janet Leach’s personal library. 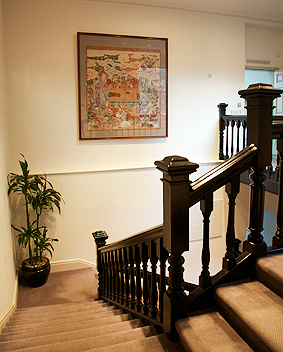 Sir Hugh and Lady Cortazzi have contributed a large and important collection of books on Japanese art and history. Many of these books are quite rare and all have been carefully collected. A noted scholar, Sir Hugh was formerly the British ambassador to Japan. Sir Hugh and Lady Cortazzi also donated about 40 Yokohama prints (ukiyo-e depicting foreigners in the second half of the 19th century) and made a long-term loan to the Institute of their important collection of historical maps of Japan, both European and Japanese in origin. 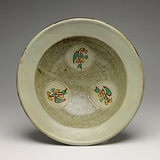 In addition, Sir Hugh and Lady Cortazzi placed their valuable collection of Japanese ceramics on long-term loan; notable among these are pieces by designated Living National Treasure Shimaoka Tatsuzo, some of which are displayed in the Sainsbury Centre for Visual Arts at UEA. More bequests followed as the reputation of the Lisa Sainsbury Library grew. Dr. Carmen Blacker, famous for her research on Japanese religions bequeathed her entire library to the Institute. 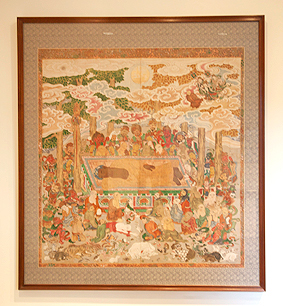 The ethnologist Professor Sir Raymond Firth gave important books from his collections, two woodblock print works and a large painting of the Nehanzu, or ‘Death of the Buddha’ which now hangs on the main stairwell in 64 The Close There have also been many individual donations as well. Dame Elizabeth commented on the pivotal role of the library for the Sainsbury Institute for the Study of Japanese Art and Culture. During the conversation Dame Elizabeth made many references to Professor Kawai. In our next issue of the e-magazine Dame Elizabeth will discuss the Institute as it stands today and at its future possibilities.